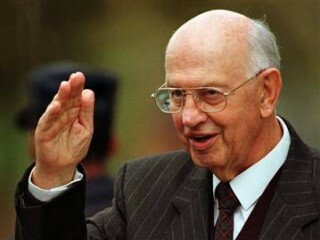 Pieter Willem Botha born 12 January 1916 – died 31 October 2006, commonly known as "P. W." and Die Groot Krokodil (Afrikaans for "The Big Crocodile"), was the prime minister of South Africa from 1978 to 1984 and the first executive state president from 1984 to 1989. He is what is referred to in South Africa as an Afrikaner, a white person who speaks Afrikaans (a form of the Dutch language) as his native language. Botha's father, also named Pieter, fought in the Boer War (1899–1902). In this war the Boers, white descendants of Dutch colonists who controlled two republics in South Africa, tried to prevent the takeover of those republics by the British. Botha attended secondary school in Bethlehem. He started his career in politics as a teenager, joining the National Party. He entered the University of the Orange Free State in Bloemfontein, South Africa, to study law, but left the university at age twenty in order to begin a full-time political career.